Hooray! 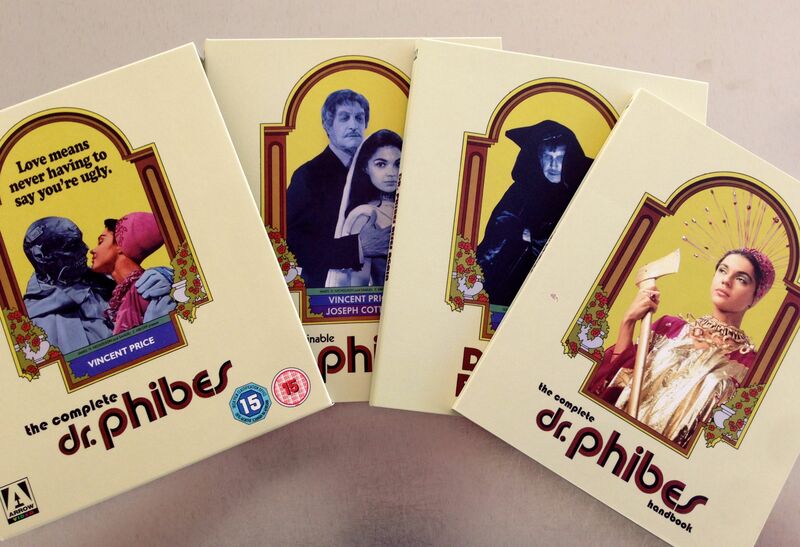 The digitally remastered box-set of Dr Phibes is finally here in pristine condition, with tons of extras and a 100-page book. Sadly, no third disc as the film series never made it to the full trilogy, thanks to a soft opening for the second one and the heads of American International Pictures falling out with one another. The third would have had Phibes fighting the Nazis, although another sequel had been mooted with the intriguing title ‘The Bride of Dr Phibe’ (intriguing because we are awaiting her return through vols 1 & 2). Robert Fuest’s camp classics were misunderstood at the time, even though they’re the epitome of the era. There’s no reason at all why the series couldn’t be revived now, and I’ve long wanted to write something in a similar (open) vein. In many ways, ‘Theatre of Blood’ is an unofficial third part to the Dr Phibes films because it clearly would never have got off the ground without them. That leaves Vincent Price’s flawed ‘Madhouse’, which tried to recapture the flavour and failed. I do think part of the relationship between Inspector Trout and his sidekick ended up in the Bryant & May books (it was certainly echoed by John Landis for his detectives in ‘An American Werewolf In London’). While the continuing fascination with these star-laden films is to do with what might have been, we’re left with the films themselves, a reminder that there was a time when British films were fun to make and view. Love those films. They came recommended by people I trust, but I was expecting standard -if competent- mad scientist fare (yes, I am ignorant!). I had such fun with my first viewing, I always rewatch both of them back to back, I’d have loved to see the good doctor kicking some nazi arse! Willaim Goldstein, the creator of Dr Phibes, has published a ‘box set*’ of stories. Containing novelisations of both films and another volume, ‘Doctor Phbibes In The Beginning’, which details the events that lead up to the first film.